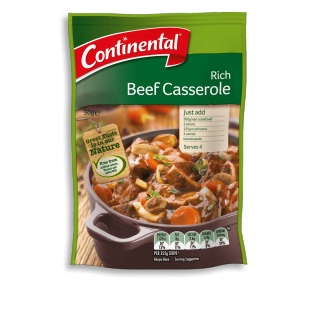 Continental's fast and simple beef casserole recipe base is blended with real ingredients & rich flavours every time. Learn how to create this dish here. Wheat flour, corn starch, maltodextrin (from wheat), burnt sugar, onion powder, salt, natural flavours, soy sauce powder (contains wheat), sage, sunflower oil, pepper, garlic extract. Allergens:Contains wheat and soybean products.Made on equipment that also processes products containing milk, peanut, egg, sesame, fish and crustacea. Simply... 1. Preheat oven to 180˚C. Combine 500g lean cubed beef (rump or topside), 2 sliced onions, 3 cups halved mushrooms and 2 carrots, sliced in an ovenproof casserole dish. 2. Pour combined Recipe Base, 1¼ cups water and 2 tablespoons tomato paste over beef mixture , stir to combine. Cover and cook for 1½ hours or until beef is tender, stirring occasionally. Serve with mashed potato and broccoli. Slow Cooker Method: Place beef, onions, mushroom and carrots into the bowl of a 4.5Litre slow cooker. Combine recipe base mix, water and tomato paste in a jug. Pour over beef mixture. Stir to combine. Cover and cook on HIGH for 4 hours or until beef is tender. Like others on here, i’d like to use the Recipe in the slow cooKer, but the instructions are cuT off. Would love this to be fixed please. Hey i would love to get the slow cooker version as the website doesnt display? Hi Kylie, we've just added the slow cooking instructions on our website. Let us know if you can't find them. HI Sue, have you had a look in IGA & Coles? Try giving their helpdesk a call at 1300 135 690 (IGA) & 1800 061 562 (Coles) & they might be able to hunt some down for you. I want to cook in the slowcooker but there are no instruCtions on the website despite the packet saying there would be. Am i looking in the wrong spot? Hi, sorry for the late response. We've just recently uploaded the slow cooking instructions on our website. Have you found it? thank you for emailing slow cooker instructions to me - (basically use 1/4 cup water less).i used oyster blade steak and cooked on low setting for 8 hours - delicious. Hi Rob, are you looking for our slow cooking instructions? We'll email that to you shortly.